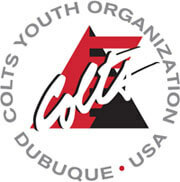 At its regularly scheduled August meeting held last week in Dubuque, Iowa, the board of directors of the Colts Youth Organization announced a restructuring of its administrative staff. According to Board President Bruce Hallahan, "This restructuring will harness the depth of our professional management experience in a new way to provide an even stronger foundation for our continued growth in the years ahead. We've been discussing a new organizational model and feel we are ready to implement this change now." "We have enviable depth, talent and experience in our staff that makes this reorganization possible, and our 50th anniversary season in 2013 provides a tremendous opportunity to generate additional support and awareness," Hallahan said. Greg Orwoll, who has served the organization as its executive director since 1984, will move to the newly created role of Director of Development, where he will report to the board of directors and be responsible for fundraising and development. This will afford Orwoll the opportunity to focus full-time on resource development while providing a more reasonable workload and time with his new family. "After 28 years of being immersed in the day-to-day operations, this creates a much more manageable existence for me personally and makes resource development a higher priority for the organization, while providing a needed fresh spark for the Colts," said Orwoll. Expanding her role as Youth Programs Director, which has included directorship of the Colt Cadets, Vicki Schaffer will add the Colts to her responsibilities. Jeff MacFarlane will become interim Executive Director of the corporation, where he will be responsible for the day-to-day business operations of the organization. "Vicki and Jeff have a great deal of experience and expertise that will allow them to grow and improve our day-to-day operations, while I will be able to devote all my energy to cultivating new and expanded relationships, support and opportunities in the Dubuque and drum corps community," Orwoll said.